To ensure an enduring quality standard and durability, Spiegelau has a strong commitment to its production sites in Germany. Modern technology and optimized machine made production enable Spiegelau to offer high quality products at affordable prices. We put a lot of human effort and passion into delivering the perfect product! While still a liquid, Spiegelau glass passes through platinum-lined tubes to eliminate any imperfections and inconsistencies that can be introduced by other linings. This results in wine glasses independently verified to resist scratching, markings, loss of brilliance or change in color after 1,500 dishwasher cycles. Spiegelau glasses are extremely transparent, clear and brilliant. But how can these benefits be achieved? To start with, it depends to a great extent on the type of glass used and the characteristics of the ingredients. 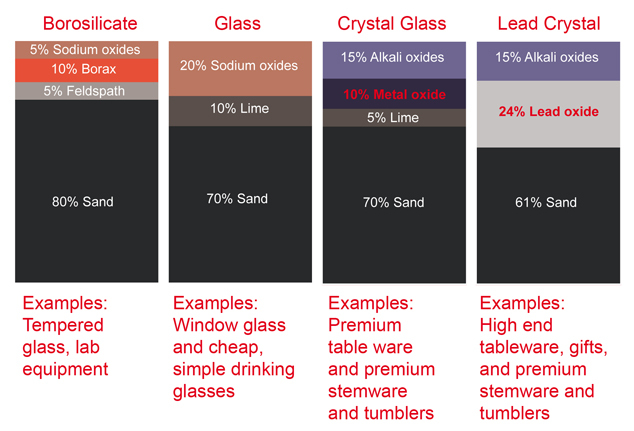 Glass consists of sand, lime (an alkaline earth oxide), Sodium or Potassium oxides (Alkali oxide) and a certain amount of cullet of the same composition. These ingredients will be melted at approx. 1500°C and in later steps formed to the desired product. Spiegelau glasses are made of Crystal glass. The high quality of the Crystal ingredients make the Spiegelau products more durable, dishwasher safe, break resistant and also more brilliant than other glasses made with cheaper glass compositions. Crystal glass contains at least 10% Metal oxides. Elements like Potassium enhance light refraction and transparency and make the glass more brilliant. High quality sand lets glasses shine transparently and clear. Pure sand that contains only very little iron avoids greenish or other colored effects in the glass. From creating fine glass mirrors for the old Royal courts of Europe to manufacturing sturdy yet fine glassware for the modern-day hospitality trade, Spiegelau has a history of high-performance. For five centuries we have laboured to combine hand craftsmanship with the latest glass-making techniques.